BOSTON, May 13, 2017 – The American Urological Association (AUA) today released a new list of recommendations regarding specific tests or treatments that are commonly ordered but not always necessary in urology, or urologic management that could be improved, as part of the Choosing Wisely campaign, an initiative of the ABIM Foundation. The list, the third released by the AUA, identifies five targeted, evidence-based recommendations that can support conversations between patients and physicians about what care is really necessary. The AUA list was introduced today during the 112th Annual Meeting of the AUA, currently taking place in Boston. DON’T treat low-risk clinically localized prostate cancer (e.g., Gleason score is less than 7, PSA less than 10.0 ng/mL, and tumor stage T2 or less) without discussing active surveillance as part of the shared decision-making process. Since the release of the AUA’s previous lists, numerous potential topics arose prompting the AUA’s continued involvement. As with the previous lists, AUA members were asked to take an active role in the development of this list by first submitting suggestions for recommendations and later by voting for their top suggestions from a list compiled by the Choosing Wisely Workgroup. Member response again was overwhelming, indicating the growing interest of urologists in Choosing Wisely and the care provided to patients. This was also reflected in the numerous candidates who applied or whose applications were submitted for the inaugural AUA Choosing Wisely Champions program in 2016. About the ABIM Foundation: The mission of the ABIM Foundation is to advance medical professionalism to improve the health care system. We achieve this by collaborating with physicians and physician leaders, medical trainees, health care delivery systems, payers, policy makers, consumer organizations and patients to foster a shared understanding of professionalism and how they can adopt the tenets of professionalism in practice. To learn more about the ABIM Foundation, visit www.abimfoundation.org, connect with us on Facebook or follow us on Twitter. 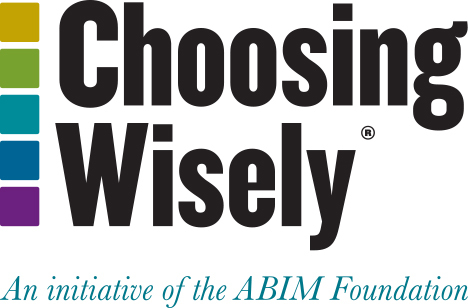 About Choosing Wisely: First announced in December 2011, Choosing Wisely is part of a multi-year effort led by the ABIM Foundation to support and engage physicians in being better stewards of finite health care resources. Participating specialty societies are working with the ABIM Foundation and Consumer Reports to share the lists widely with their members and convene discussions about the physician’s role in helping patients make wise choices.